More drivers from Glendale Heights and Bloomingdale looking for an exceptional compact sedan choose the 2015 Chevrolet Cruze primarily because it offers contemporary styling, a fun-to-drive and fuel-efficient engine, and a long and surprising list of standard features at every trim level. Find out how the latest Cruze compares to the 2015 Honda Civic, and then come check it out in person at Sunrise Chevrolet. We are conveniently located in Glendale Heights, just a short drive from Bloomingdale. Both sedans are available with a number of engine options, but the 2015 Chevrolet Cruze exclusively offers a turbocharged 2.0L diesel four-cylinder that puts out 151 hp and an impressive 264 lb-ft torque while getting as high as 46 mpg on the highway. Meanwhile, the 2015 Honda Civic has no available engine to match those ratings for torque and efficiency. Thanks to a longer list of standard safety features, the current Cruze has received superior scores in independent crash tests than the Civic.Full-length side curtain airbags, front knee airbags, and front and rear side-impact airbags all come standard, and rear cross-path detection is available. It is thanks options like these the Cruze earned a five-star rating for front crash protection from the National Highway Traffic Safety Administration.The Civic has just front side airbags, side curtain airbags and no rear warning system, part of the reason it received only four stars for front crash protection. Several exciting features are exclusive to the 2015 Chevrolet Cruze, including OnStar, which turns the cabin into a mobile Wi-Fi hotspot that allows up to seven devices connect to the Internet while on the go, and higher-level trims come with a premium nine-speaker stereo. 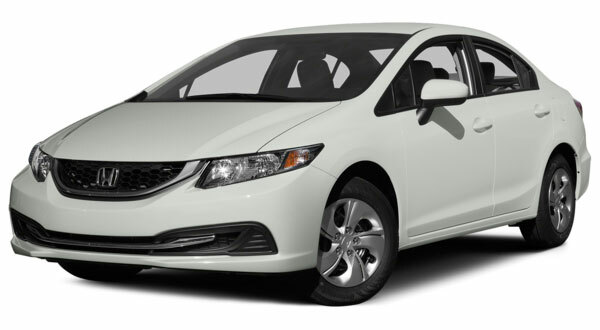 Wi-Fi isn’t offered on any trim of the 2015 Honda Civic, and the nicest stereo available has just seven speakers. The massive trunk on the 2015 Chevrolet Cruze helps you travel everywhere with more of the things you need.Itboasts up to 15.0 cubic feet of space, while the 2015 Honda Civic’s trunk has only 12.5 cubic feet for cargo, a number that drops even further on the coupe and hybrid configurations. Once you’re ready to upgrade to the 2015 Chevrolet Cruze, plan your test drive at Sunrise Chevrolet, located at 414 North Ave. in Glendale Heights, IL, less than 10 minutes from Bloomingdale and easy to find just south of Glen Ellyn Road. Otherwise, feel free to reach out to our sales staff if you need any questions answered beforehand!